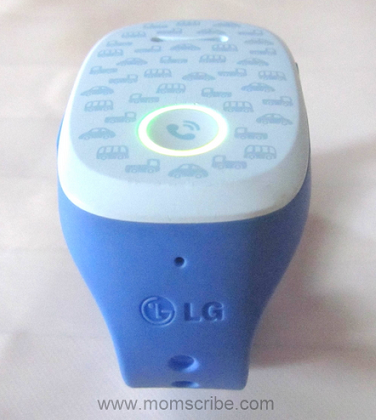 The LG KizON is a wearable device designed to enable children aged 4 to 9 to easily connect with their parents. No, it is not a smart phone or mobile but a simple tracking device with a single call button. The LG KizON child-tracking bracelet works by connecting to an KizON app on the parent’s mobile device helping them to call and keep track of their kid's location. This combination is a great feature to provide worrying parents to have a piece of mind when their kids travel alone to a nearby school, place or neighbourhood area and even make sure the kids don’t get lost while on a shopping spree or on a holiday. The design is simple and comes in two colours with blue for boys (like mine above) and pink for girls. The LG Kizon device has two openings on either side, one for inserting the micro SIM and the other for charging the device. The big size of the KizON bracelet will make sure that the Berry (my son) can find it easily if it is misplaced or lost. 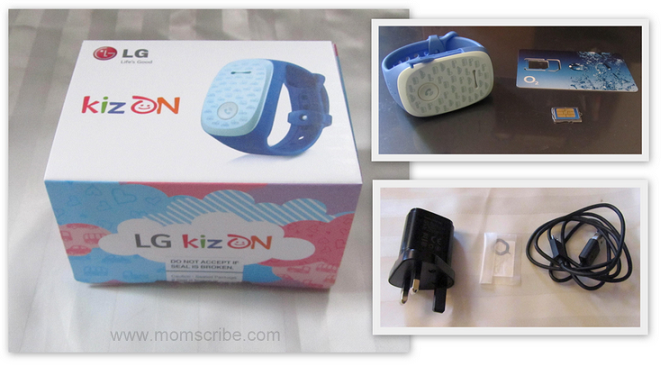 This KizON mobile phone accessories from LG sits comfortably on the child's wrist with its wide and smooth rubber strap. 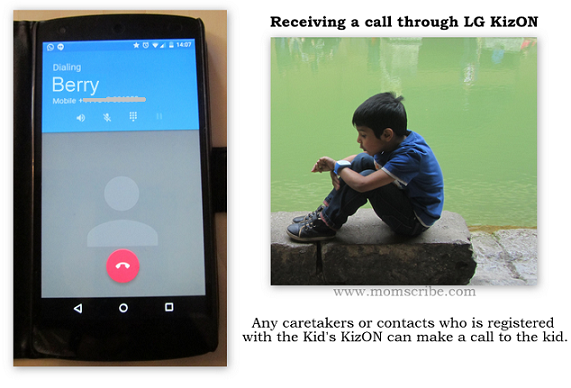 The most basic function of the KizON device is connecting parents-kids through a simple call feature without having to hand them a mobile or smart phone because of security reasons. The KizON device can be used to call two caretakers (two outgoing calls) and the priority will be given to the first caretaker. 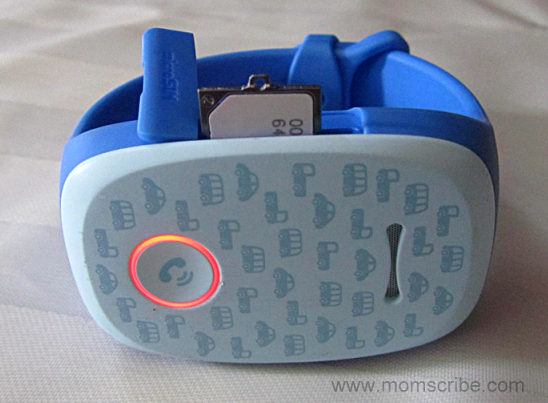 As for the incoming calls, you can choose to add four phone numbers (or guest calls) apart from the two caretakers totaling to six incoming calls to connect with the child mobile bracelet. This can be done through the app's settings. How to link up the KizON App and the KizON device? The first step is to download and install the KizON application from the Google play store. Then, you will be asked to enter the kid's name and their mobile number which can be found on backside of the mobile card. Next, you will be asked to enter the start-up number to link the app to the device. Initially, the last six digits of the IMEI number is your start up number which can be found on the backside of the KizON device. 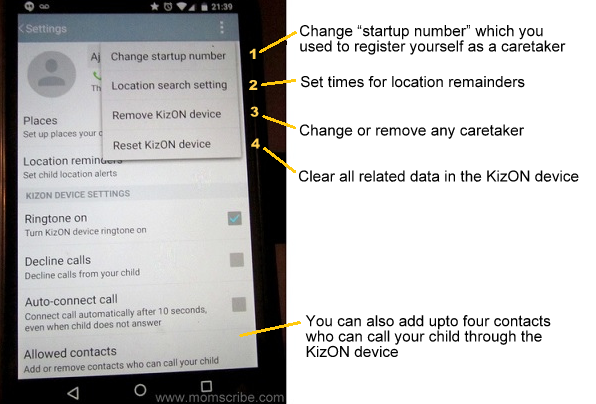 It is important to note that the order in which you will register yourself through your KizON app using the Kid’s mobile number and start up number will decide who will be the first caretaker or the second caretaker. 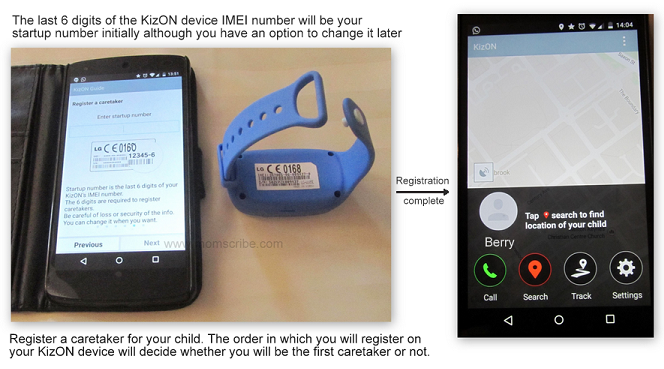 After successful registration, you can straight way start using the app for calling and tracking your child. As for the tracking feature, my experience with it was mixed mainly because the tracking was slow and when I used it from my home, it gave me an approximate address (not exact) details both through text messages as well as through map location. This was mainly because it depended upon the strength of the satellite signal as well as the mobile network which varies from location to location. Another fact is that I need to think twice before using the track feature of the app is because it debits the cost of a SMS text both from my mobile as well as from Berry's KizON. So, you have to use it wisely. To make an call, Berry holds and press the call button for about two seconds. And every time he does that, the voice reply from the KizOn device alerts him that he is making a call. He can even hear a ringing sound from his tracking bracelet. This call normally gets connected to the first caretaker and in case if it is not answered, Berry can leave a voice message after the beep which will be send to the parent's voice mailbox. 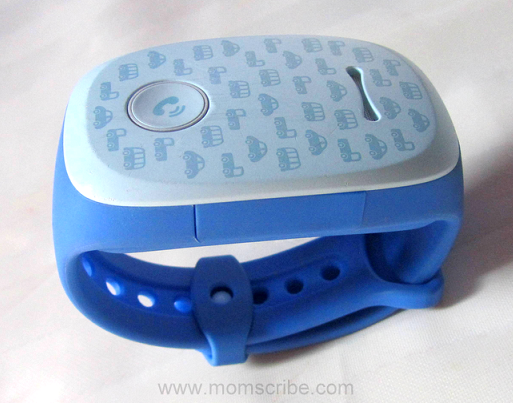 As a parent, I found this KizON child-tracking bracelet very handy, comfortable, durable, child-friendly, easy to set up and useful for both calling and tracking the child. But sometimes, I look for features that might be more appealing and they were a presence of a digital time display somewhere in between the call button and the speaker, colour /design options to choose from and an option to turn on/off text notifications from the KizON device thereby saving few pennies. Overall, I am very pleased with the product especially as my little one has been running around quite a lot and chances are that I might track him now with a peace a of mind. Disclosure: “I am a member of the Mumsnet Bloggers Network Research Panel, a group of parent bloggers who have volunteered to review products, services, events and brands for Mumsnet. I have not paid for the product or to attend an event. I have editorial control and retain full editorial integrity”. Amazing! This product is the need of the hour if I may say so. Not even kids are safe these days. Such a device is a boon!! Good one, would definitely save many parents from the anxiety of worrying whether their children will reach home safe.